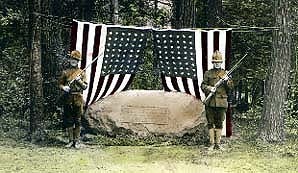 "The Dedication of Mr. Letchworth's Rock"
According to the American Scenic and Historic Preservation Society's 1917 annual report, a granite boulder weighing approximately eight or ten tons was moved from the hillside about the Glen Iris plateau to Inspiration Point. The great rock, deposited by glaciers during the last ice age, would become "Mr. Letchworth's Rock". On May 26. 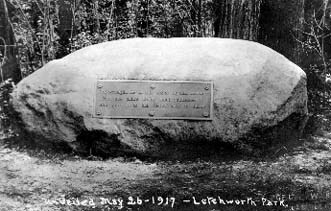 1917, officials of Letchworth State Park, the American Scenic and Historic Preservation Society, and the Letchworth Family made a special dedication to the memory of the Park's benefactor, Wm P. Letchworth at the boulder, marking the first memorial dedicated to Mr. Letchworth in the Park that bears his name. More information on the Memorial Rock can be found in " A Glimpse of a Special Rock"
These real photo postcards come from the ceremonies. This special real photo postcard shows the Memorial Boulder and Plaque. On the back is written the eyewitness account of the ceremonies found below. "May 26, 1917. Warm beautiful day... Heard Senator Knight, Chas Wheeler, Edgar Hagerman Hall (geologist) and several others speak..."
"Faculty of C(astile) H(igh) S(chool) attended the dedication of this boulder. Had our dinner at Letchworth Inn, a very beautiful and antique spot. Wandered around at our leisure and had a fine time. Miss Sherwood and I came home on the train." 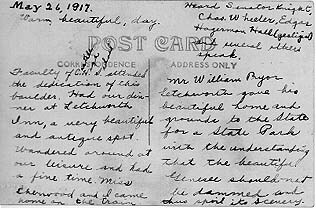 "Mr. William Pryor Letchworth gave his beautiful home and grounds to the State for a State Park with the understanding that the beautiful Genesee should not be dammed and thus spoil its scenery." Also see " A Glimpse of a Special Rock"